U.S. Rep. Corrine Brown And Staffer Indicted On Federal Fraud Charges : The Two-Way The Florida Democrat and her chief of staff are accused of pocketing and misusing money they had helped raise for a charity. 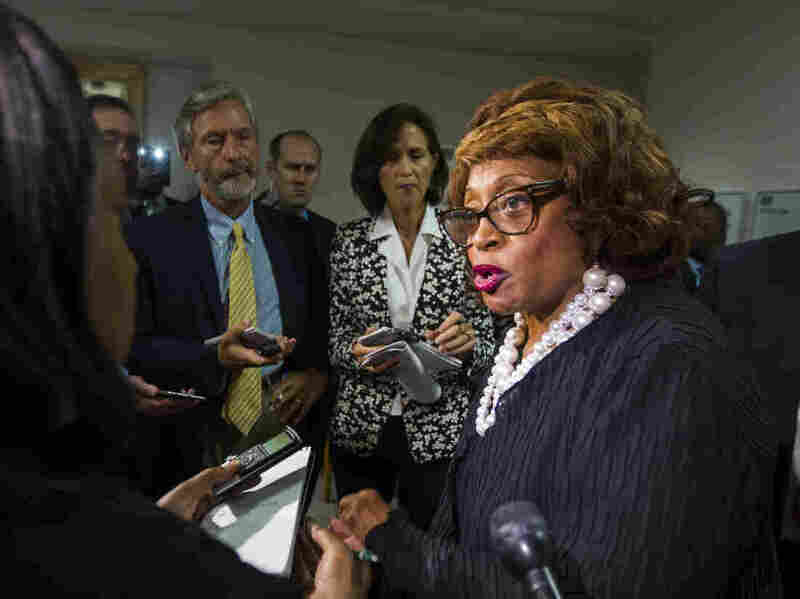 Rep. Corrine Brown, pictured last year, has been indicted on federal fraud and conspiracy charges for what prosecutors call a scheme to misuse funds raised for a charitable organization. U.S. Rep. Corrine Brown, D-Fla., and her chief of staff, Elias "Ronnie" Simmons, are facing multiple counts of fraud and other charges related to an educational charity tied to the congresswoman, according to a federal indictment. Federal prosecutors allege Brown, 69, and Simmons, 50, misled donors while soliciting donations for One Door for Education, under the guise of funding scholarships for minority students, raising more than $800,000. Instead, as NPR's Greg Allen reports for our Newscast Unit, "prosecutors say Brown, Simmons and Carla Wiley, the head of the charity, diverted the funds to their own accounts." "As part of their fundraising, prosecutors say Brown, Simmons and Wiley spent hundreds of thousands of dollars on events including a golf tournament in Ponte Vedra, Fla., and the use of luxury boxes for an NFL game and a Beyoncé concert." Wiley pleaded guilty earlier this year to one count of conspiracy to commit wire fraud, The Associated Press reports. Brown and Simmons are also charged in failing to disclose deposits and payments they received from One Door for Education on tax returns. Furthermore, Brown is accused of falsifying tax deductions on returns from 2008 to 2014, claiming donations to One Door for Education as well as churches and non-profits which prosecutors say were never made. Simmons is accused of misusing his position as Brown's chief of staff, hiring a close relative, then diverting $80,000 of the relative's salary for his personal benefit. Brown has served as a congresswoman for the Jacksonville area since 1993, during which Simmons worked as her chief of staff. Brown is currently seeking re-election.